If you pay attention to the buildings while walking around Tel Aviv you may notice that you could divide them into two distinctly different styles. Those built in the 1930s are influenced by the International (Bauhaus) style, clean lines without much ornamentation whereas, the earlier buildings were designed in an eclectic style, a combination of neo-classic architecture with other styles, for example, romantic or oriental. With the establishment of the Bezalel School, Jewish artists created art and craft with Jewish symbols in various media, metalwork, ceramic tile, glass, stone that were used as architectural details. Buildings in the eclectic style tend to be uniquely interesting and are significant landmarks. 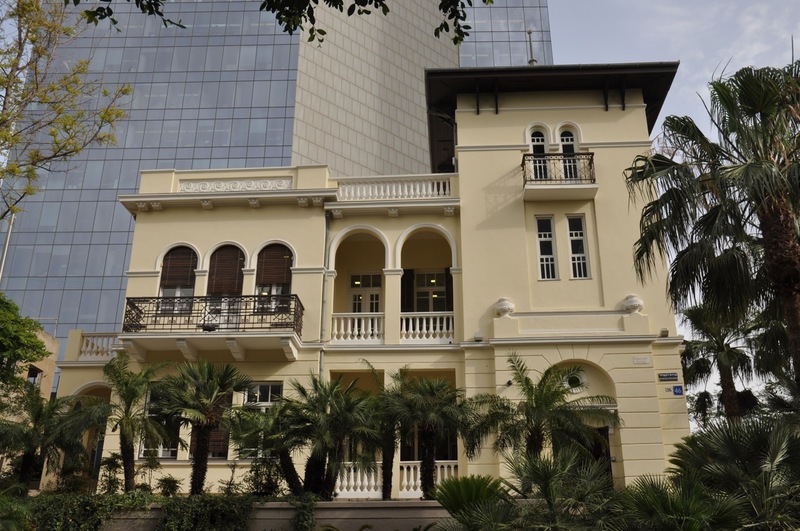 There are many examples, it is worth taking a guided tour to find them, including the beautiful Pagoda House (Alexander Levy, 1924) on the corners of Melchett, Nachmani and Montifiori, the Levine House (Yehuda Megidovich, 1924) on 46 Rothschild Boulevard and the Palm House (Tabachnik, 1928) at 8 Nahalat Binyamin. The building was inspired by southern Asian pagodas, and is the first building in Tel Aviv to have an elevator. The building is composed of Doric pillars, Arabic style arches, and other elements that connect East and West, in a combination of styles. Impressively situated off King Albert Square. This magnificent urban villa was built on a 1700 sq m plot on a small hill on Rothschild Boulevard for Yakov Levine in 1924. The Levine family lived on the second floor and rented out the first. One of its special features is a turret with a mechanically operated roof that could be opened to create space for a sukka. The architect was Yehuda Megidovich who was Tel Aviv’s first city engineer. 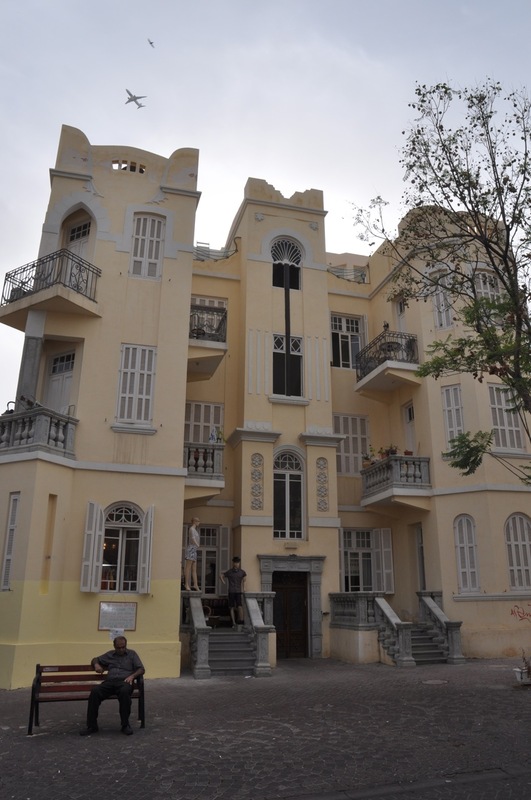 Between 1919 and 1951 he designed more then 500 buildings in Tel Aviv, among them the House of Pillars (1925), Nordau Hotel, Ben Nahum Hotel (1921) and the Great Synagogue. Look at buildings he designed for one of his signature trademarks up at the roof line, a tower or dome. The building was almost demolished in 1943 by a developer who wanted to build a six storey building in its place and was badly damaged by a bomb planted by members of Lehi protesting Jewish discrimination in the USSR in 1953 (when it was the Soviet embassy). In 1995 the developer Akirov bought the property and renovated the building in exchange for permission to build a 26 floor skyscraper, Elrov Tower, on the site. 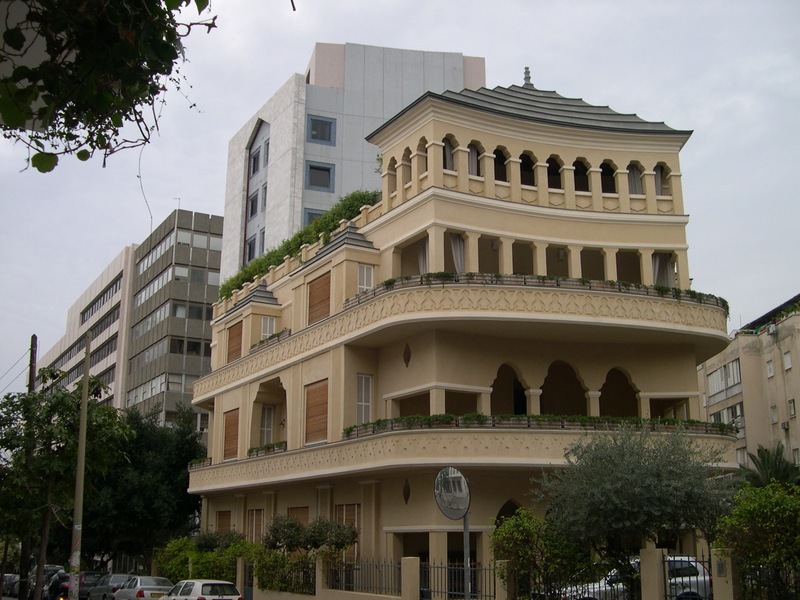 The architect Tabachnick wanted to create an architecture grounded in Israel that would emphasize Jewish motifs often blended with art-nouveau style. In the center section of the building is a window in the shape of a palm tree from which the building gets its name. Note the use of the Star of David, the grillwork of the railings in the shape of the menorah (Jewish candelabra) and the tops of the 3 towers in the shape of an altar. This entry was posted in Architecture, Tel Aviv on December 9, 2010 by Shmuel Browns. Whacky but very cool. Especially the palm house.